Steamless is a DRM remover of the SteamStub variants. 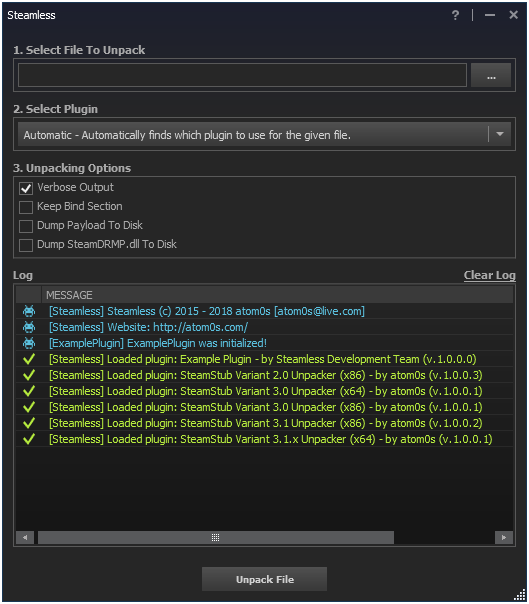 The goal of Steamless is to make a single solution for unpacking all Steam DRM packed files. Steamless aims to support as many games as possible. However, due to personal limited funds, I cannot test every game myself. Steamworks Digital Rights Management wraps your game's compiled executable and checks to make sure that it is running under an authenticated instance of Steam. This DRM solution is the same as the one used to protect games like Half-Life 2 and Counter-Strike: Source. Steamworks DRM has been heavily road-tested and is customer-friendly. In addition to DRM solutions, Steamworks also offers protection for game through day one release by shipping encrypted media to stores worldwide. There's no worry that your game will leak early from the manufacturing path, because your game stays encrypted until the moment you decide to release it. This protection can be added to your game simply by handing us finished bits or a gold master. There is currently no support for this version of the DRM. 32bit version of this variant is supported. 64bit version of this variant is supported. Please note; these version numbers are superficial. They are an assumed version based on major changes to the DRM over its lifespan. disclaimer may not apply to You. Steamless is not intended for malicious use or for the use of obtaining or playing games illegally. Steamless should only be used on games that you legally purchased and own. Steamless is not associated with Steam or any of its partners / affiliates. No code used within Steamless is taken from Valve or any of its partners / affiliates. Steamless is released for educational purposes in the hopes to learn and understand DRM technologies. Use Steamless at your own risk. I, atom0s, am not responsible for what happens while using Steamless. You take full reponsibility for any outcome that happens to you while using this application. Do not distribute unpacked files. PeFile32 - Added support for reading the ImageTlsDirectory section. SteamStub Variant 3.1 (x86) - Adjusted the unpacker to attempt to use the Tls callback as the real OEP if general unpacking fails. Adjusted Steamless to use older Aero presentation library for Windows 7 support. Fixed issue with variant 2.0 (x86) unpacker failing to unpack files with non-encrypted code sections. Fixed issue with header size not unpacking properly for certain files. Fixed issue with TLS callbacks not being unpacked properly when present. Added support for 64bit version of SteamStub Variant 3.0. Added fallback pattern for variant 2.0 (x86). Adjusted the default window size on startup so that the full plugin names are seen with default screen settings. Added support for new SteamStub v3.1.2 variant. Updated all plugins to make use of reflection to get their versions from their assembly info. Updated all copyrights to include 2018. Updated the list of supported versions. Added SteamStub 2.x variant D0 (header size) support. Fixed some issues with the 2.x disassembler using incorrect types. Updated the SharpDisasm.dll file to latest version. Added new experimental features option. The new SteamStub 2.x variant offset dumper should be able to dump most of the v2 files that would fail before. This newer feature is experimental for now and uses disassembling to pull the offsets instead. This has only been tested on a few files so far, but all seems to work ok. In order to use this feature, you must check the new 'Use Experimental Features' box before attempting to unpack a file.